cheaper than the one posted earlier to save you 12p!!! Cheer's... I ordered a couple. Bought 2 of these a few days ago. Good job I bought two, because the first one randomly stopped working after the first day. It was working fine...didn't move the cables or even touch them. Went to turn on the PS3 the next day...and the cable had broken! Bought 2 of these a few days ago. Good job I bought two, because the … Bought 2 of these a few days ago. Good job I bought two, because the first one randomly stopped working after the first day. It was working fine...didn't move the cables or even touch them. Went to turn on the PS3 the next day...and the cable had broken!Avoid. This is why smarter members invest in Monster cables and the like. everyone seems to be monster fanbois because of the name. same as apple, big brand name **** products. you would be a fool to spend £90 on a monster cable when a £20-£30 cable will be the same speed cable. Same speed? £20-30? Aside from durability and the quality of the actual components, there is no 'speed' difference at all, or quality difference between cables. I'd recommend spending a few quid on a cable to ensure that its actually durable enough to stand up to the job (unlike these ones), but £20 is still waaaaaay to much, but It's probably what you'd pay for a 'low-end' cable down at Currys etc. £50? Well, one company sells a 1m HDMI cable for £1000 - so I guess that would be cheap to these idiots. Agree with the '£50 cable' guy, clearly anyone can see that the more expensive the cable the clearer the digital 1s and 0s will be... guy in Comet told me so and they are a massive, successful national brand. too many trolls on HUKD these days! 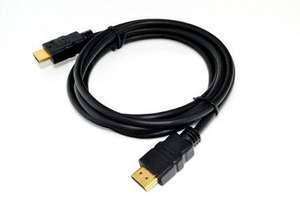 An HDMI cable is nothing more than 2 connectors attached to each other by a number of electrical wires. Cost pennies to manufacture, cost in a sensible profit margin, and you have there true valve. A £90 cable is marketing hype and a very large profit. Cold, my 1s and 0s were muffled and lacked clarity with this cable. Cold. Everyone knows these need to be diamond encrusted in order to obtain the best possible clarity when viewing standard definition VHS streams. For half decent build quality and low prices, then you won't go wrong with Belkin ones. OK, your eloquence has persuaded me. Hot. Its done it again!!!! I click another comment to reply to and it bloody replies to this one. I was trying to reply to the guy that said "cables don't have versions" to confirm "some do, HDMI does." Its done it again!!!! I click another comment to reply to and it bloody … Its done it again!!!! I click another comment to reply to and it bloody replies to this one. I was trying to reply to the guy that said "cables don't have versions" to confirm "some do, HDMI does." this is just the second page of that thread. Ha ha, so the choices are a dirt-cheap, poorly made Piece-O-Sh... OR a way overpriced one from ONE make only? Ever hear of the middle ground? Looking on Amazon, there are a few reasonable-looking choices around 2m for £4-ish. Ha ha, so the choices are a dirt-cheap, poorly made Piece-O-Sh... OR a … Ha ha, so the choices are a dirt-cheap, poorly made Piece-O-Sh... OR a way overpriced one from ONE make only? Ever hear of the middle ground? Looking on Amazon, there are a few reasonable-looking choices around 2m for £4-ish. Your story is even cooler now that you've posted it twice. Actually they do, it's just irrelevant to most users. I remember the old HDMI flame wars, 75 pages of seething angry people ready to go to war over cheap vs expensive cables. This thread is dissapoint. HDMI Cables do not have Version No.s and haven't had since January of last year. HDMI hardware (TVs, AV equipment) does, but not cables. I remember the old HDMI flame wars, 75 pages of seething angry people … I remember the old HDMI flame wars, 75 pages of seething angry people ready to go to war over cheap vs expensive cables. This thread is dissapoint. Yes my post is true, and the evidence was provided beyond any reasonable doubt during that war!!! and I guess I was trying to start World War 3 with the post. More expensive doesn't mean better!!! I bought my HDMI cables for 2p each (yes actually 2p) about 4 years back and they work perfectly to this day. If you say a "Monster" cable costs £90 then I would expect it to be 4500 times better quality than mine... although I doubt it will be! Anyway why would you pay £90 for a brand just to tie it up behind your TV that no one ever gets to see? why would you pay £90 for a brand just to tie it up behind your TV that … why would you pay £90 for a brand just to tie it up behind your TV that no one ever gets to see? That above was what my original, very first post in this thread looked like, word-for-word. It was sent from my mobile, which I then later EDITED (on a desktop) to become the well-polished, useful and smart post you see before you on page 1. I then DID NOT POST IN THIS THREAD AGAIN UNTIL THIS VERY REPLY. Why and HOW THE F this has happened, you'll have to work it out the HUKD web mechanics. Something odd is definitely afoot. But thanks for giving me the benefit of the doubt, you and the donkeykong who liked your comment.